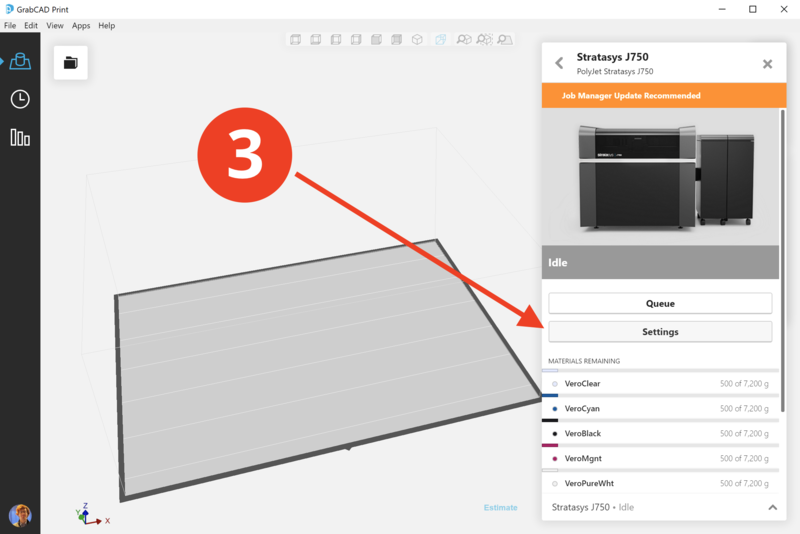 This article explains the extra steps required to connect GrabCAD Print with your Stratasys J750, Connex3, or Objet1000 Plus. If you don't have one of those, skip ahead to Connecting your FDM printers. GrabCAD Print — The software you will use to prepare print jobs for your PolyJet printer. This replaces PolyJet Studio and Objet Studio, which were sometimes referred to as the "client." Printer PC — The computer inside of the printer which runs the Embedded Software. Sometimes this is referred to as the "Embedded PC." Embedded Software — The software which displays the current state of the printer and runs on the Printer PC. Host PC — A separate PC is often included on printer installation dedicated to running the Job Manager and sometimes Objet Studio or PolyJet Studio. For the Connex3 and J750 this PC is outside of the printer, while for the Objet1000 Plus it is inclosed within the printer. This was sometimes referred to as the "Server PC." Please refer to the table below. For J750 setup, it is recommended to use Scenario 1, which excludes the Host PC altogether. 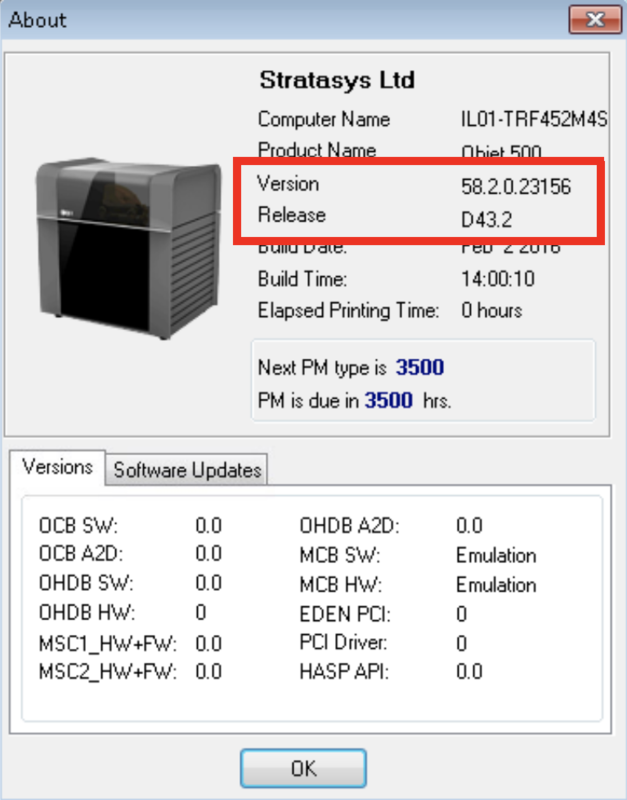 Having the GrabCAD PolyJet Job Manager and the J750 software installed together on the Printer PC increases speed and reliability. However, if your IT department restricts which computers are allowed to be connected to the LAN, you can use Scenarios 2 or 3. For Connex3 and Objet1000 Plus Setup, Scenarios 2 and 3 are recommended, because the Host PC is more powerful and can handle large jobs. It is recommended to upgrade the Embedded Software before setting up GrabCAD Print. First, check your existing Embedded Software version with Help > About. You are already running the latest version. Make a backup of the existing folder. Open windows file explorer and go to your C:\ root directory. You should see a folder which matches the name of your printer. Make a copy of this folder, and rename the copy by adding a "-backup" to the name. Your service technician may need to access this folder in case of an issue with the upgrade. Install the new Embedded Software. Extract the contents to the Printer PC. 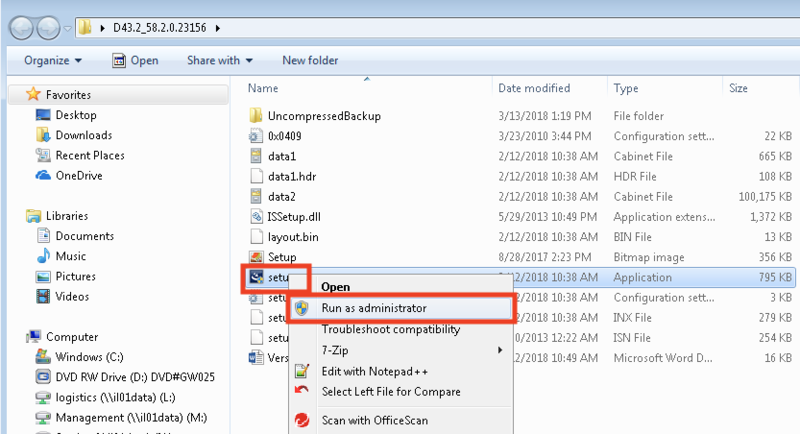 Right click on the file Setup.exe and "Run as administrator." 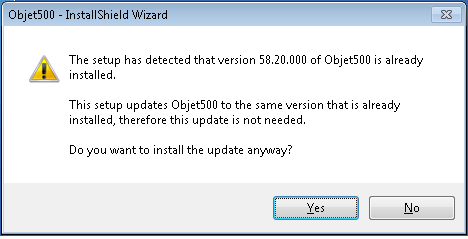 Select "Upgrade" in the installation wizard. When the following message appears, select Yes. 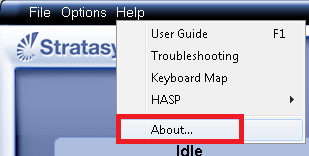 For Connex3 and Objet1000 printers, there should be a shortcut on the desktop of the Host PC called "Stop Job Manager." Double click on this shortcut to stop the Job Manager associated with Objet Studio. For J750 printers, the process is a bit different. The GrabCAD PolyJet Job Manager automatically closes the old job manager associated with PolyJet Studio, but a service called the Watch Dog will attempt to restart it. Therefore, you need to manually stop the Watch Dog process before installing the GrabCAD PolyJet Job Manager. On the Host PC, open the Task Manager and stop the service called JobManager.WatchDog. This may be running on the Printer PC, if your J750 was installed without a Host PC. 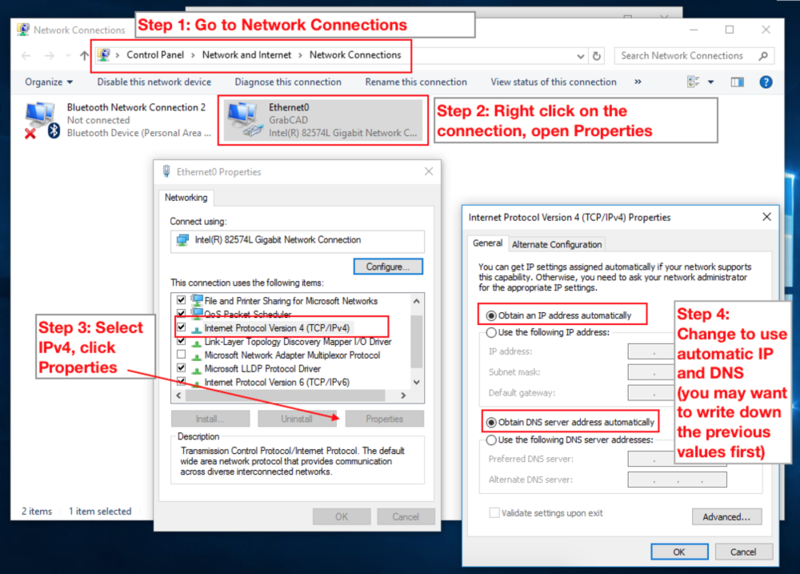 Scenario 1: Go to the Printer PC and follow these steps to give it a network IP address. Now you need to find out the IP address you just made. To do that, hit the Start button, type cmd to find the Command Prompt program and run it, then type ipconfig /all and hit enter. The IP address will be labelled "IPv4 address..."
Scenario 2: On both the Host and the Printer PCs, hit the Start button, type cmd to find the Command Prompt program and run it, then type ipconfig /all and hit enter. It's most likely that the Host PC has two network cards, so it should have two IP addresses listed. One is 10.0.0.2, and the other is what you will use for Step 5. Scenario 3: Most likely the IP address of the Printer PC is 10.0.0.1 and the Host PC is 10.0.0.2. To double check this on each PC, hit the Start button, type cmd to find the Command Prompt program and run it, then type ipconfig /all and hit enter. 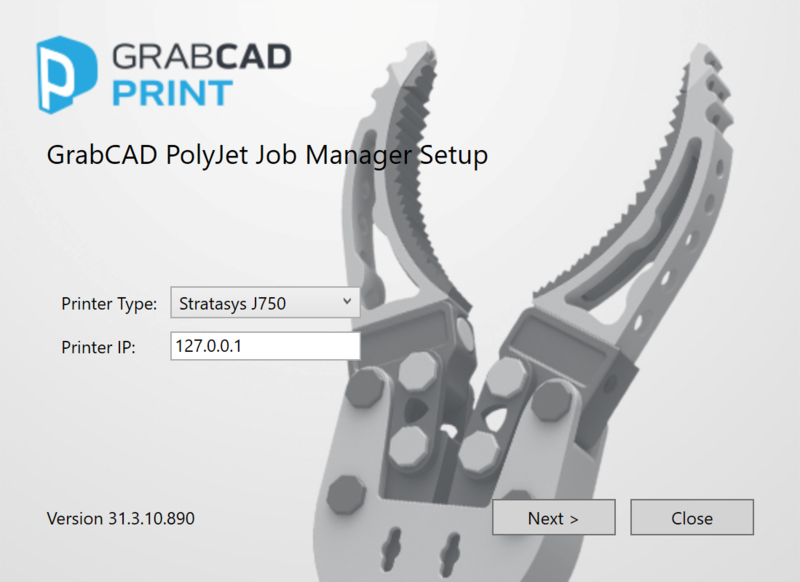 Now you're ready to install GrabCAD PolyJet Job Manager. Click here to download the installer. Scenario 1: Run the installer on the Printer PC and enter 127.0.0.1 for the Printer IP. Scenarios 2 and 3: Run the installer on the Host PC and enter the Printer PC's IP address that you got in Step 3, which is most likely 10.0.0.1. If this computer does not have internet access, you will need to download the installer elsewhere and transfer to the Host PC via the network or a USB drive. Add the printer in GrabCAD Print and start printing! 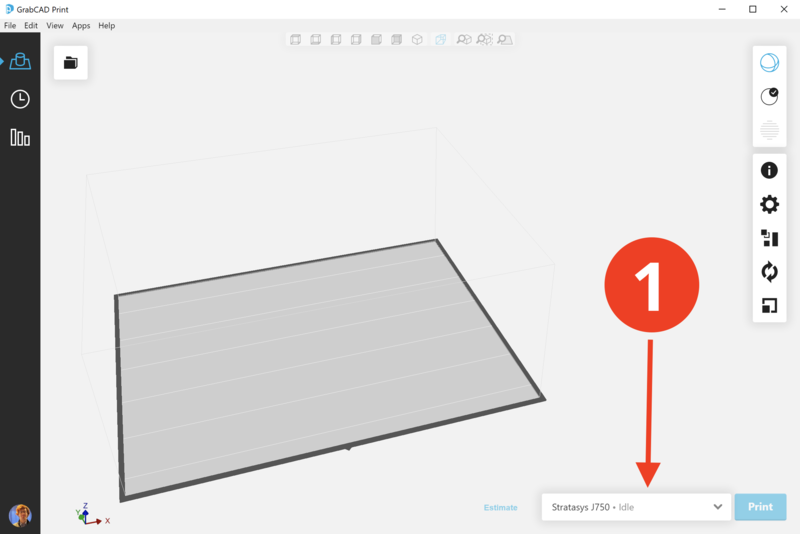 In GrabCAD Print, open the printer panel and click "Add." Scenario 1: Enter the IP address of the Printer PC you got in step 3. Scenario 2: Enter the IP address of the Host PC you got in step 3. Scenario 3: Enter 127.0.0.1 for the IP address. 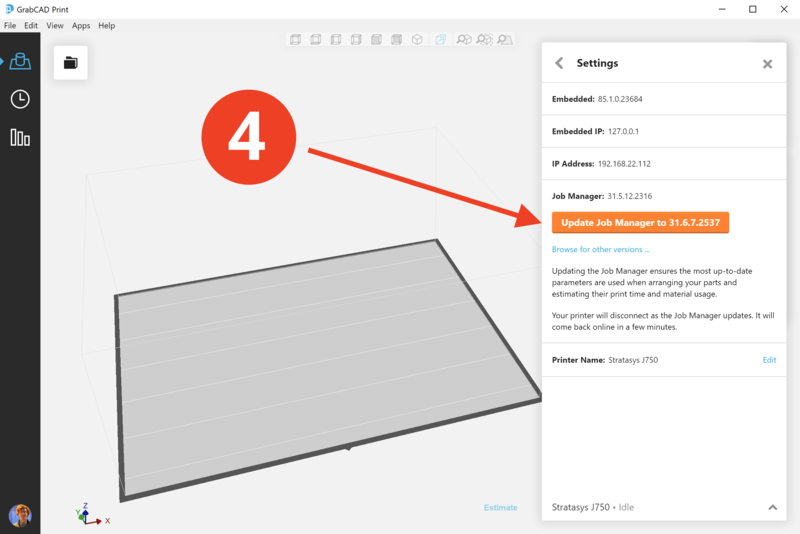 When GrabCAD Print updates, GrabCAD PolyJet Job Manager must also be updated. See also: GrabCAD Print Release Notes. When the Job Manager is out of date you will not be able to connect to the printer, and GrabCAD Print will automatically switch to the template instead. 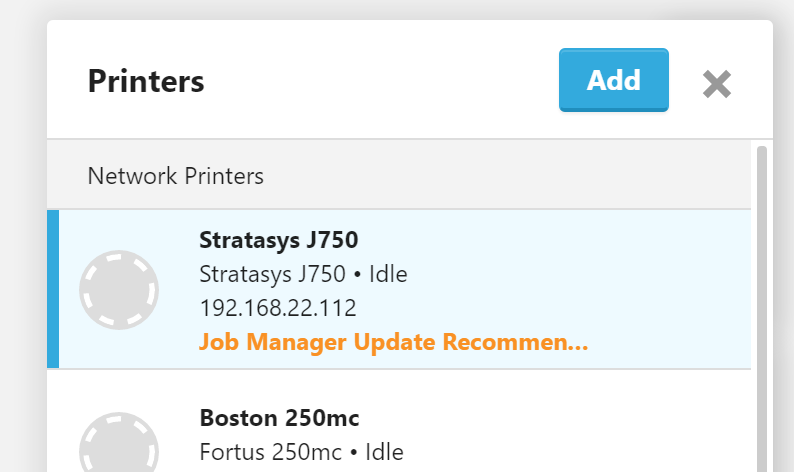 To update the Job Manager open the Printer Panel and click on the printer, then click the Settings button. 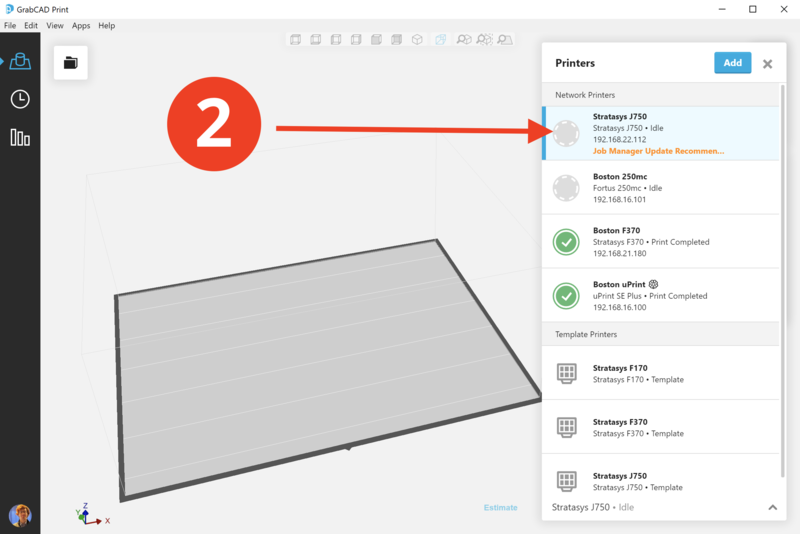 You may need to restart GrabCAD Print at the end of the update. You do not need to uninstall anything to start using PolyJet Studio or Objet Studio again, you just need to switch Job Manager watch dog processes mentioned in Step 2. In Task Manager, end the process called GCP.JobManager.Service.WatchDog and resume the process called JobManager.WatchDog. Note that these processes might be running on different computers, depending on your scenario. For the Connex3 and Objet1000 Plus, you also need to undo Step 3 and restore the IP addresses to their previous values. If your print job stopped without an error message and you cannot resume, it is likely that the Job Manager has encountered a problem. Uninstalling and reinstalling the Job Manager should resolve this issue. Please send your .PRINT file to print@grabcad.com so that we can investigate the crash. Certain models can have a "woodgrain" texture on curved vertical surfaces. There is an experimental feature which is designed to improve this behavior. If you are seeing this behavior, please contact print@grabcad.com to request access. Some users have reported some parts printing 1-2% small when Tango material is loaded but not being used. This issue is currently under investigation. In some cases, the time and material estimations can be quite different from the actual print time. This is currently under investigation, so if you hit this issue, please go to Help > Give Feedback and attach the project file to your message, along with proof of the actual elapsed print time. GCP.JobManager.MainService.exe - This is the Job Manager installed in Step 4. It manages jobs, slices the model and sends this to the Printer PC. It has no user interface. GCP.JobManager.Service.WatchDog.exe - This monitors the above service, and restarts it in case of a crash. There is no user interface. STRATASYS_J750.exe - This is the printer control application on the J750 that takes the slices, moves the motors, controls the heads, etc. This program is the user interface for controlling the J750. Objet1000.exe - This is the printer control application on the Objet1000 Plus that takes the slices, moves the motors, controls the heads, etc. This program is the user interface for controlling the Objet1000 Plus. In Scenario 1, all of these programs run on the Printer PC.